When one element of design is repeated throughout an entire interior space, it brings a relaxing feel of unity and cohesiveness. 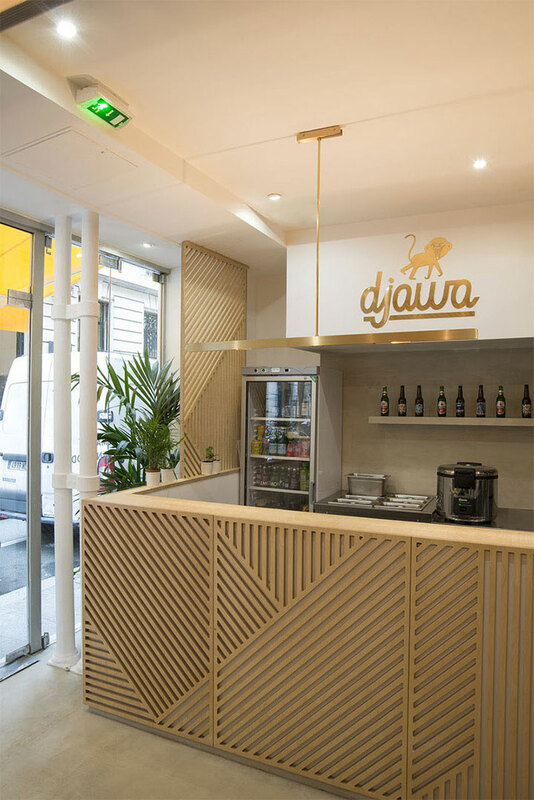 This is exactly what the design of the Indonesian restaurant djawa in Paris achieves by using CNC cut panels to line up its walls – and not only. 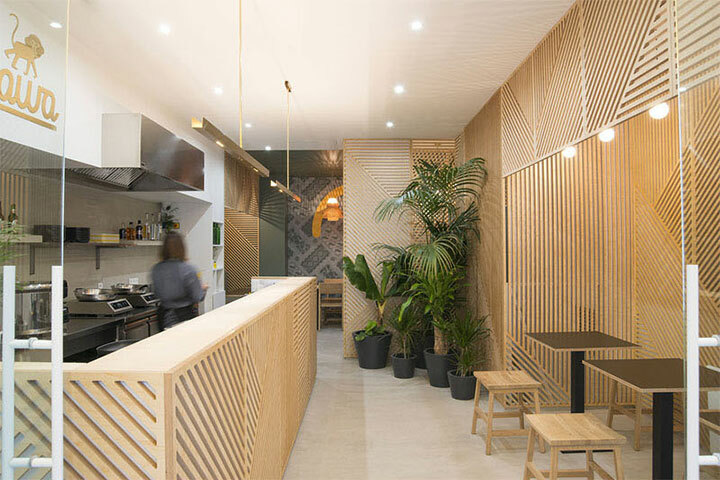 Designed by Studio Hekla, the restaurant makes heavy use of wood as wall treatment, yet the result is a light and luminous space, refreshed rather than weighed down by this abundance of natural materials. 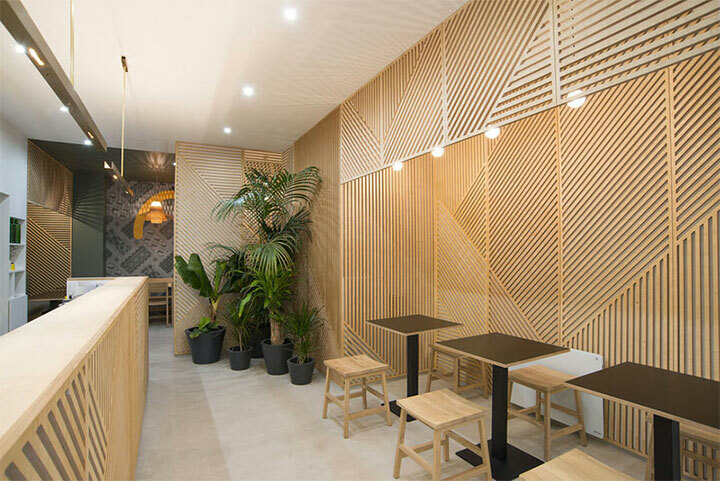 First, a glass entrance door and large windows take full advantage of natural light that, combined with the light-toned wood, sets up the mood for the restaurant. 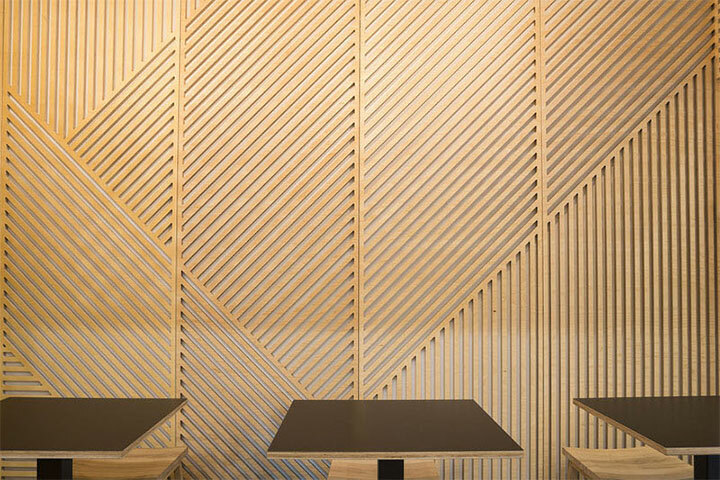 Mixing vertical, horizontal and oblique cuts in an abstract pattern that extends across the walls, the wooden panels introduce an element of visual interest, but never overwhelm the space. There is a sense of order in the geometrical patterns that stretch from the light-colored ceiling to the floor. 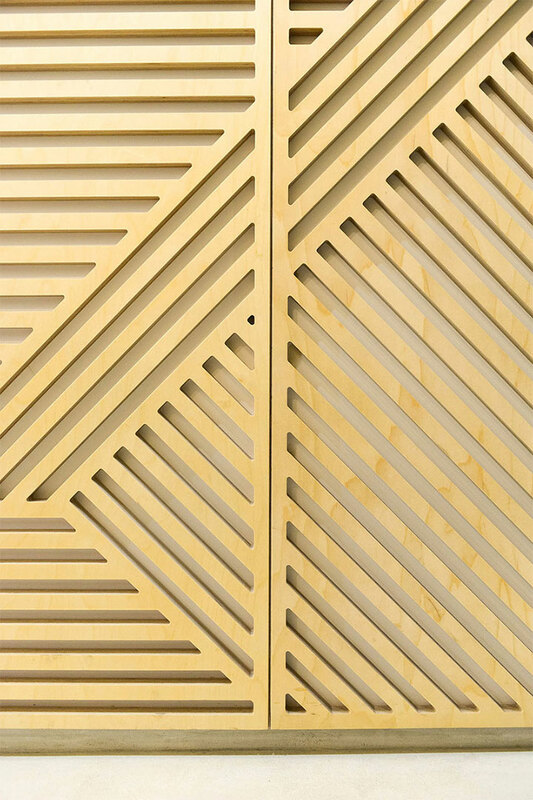 The wood panels are used in more than one way: first, to cover the walls for enhanced aesthetic appeal; second, to create dividers and small niches in an architectural attempt to create an interesting space. 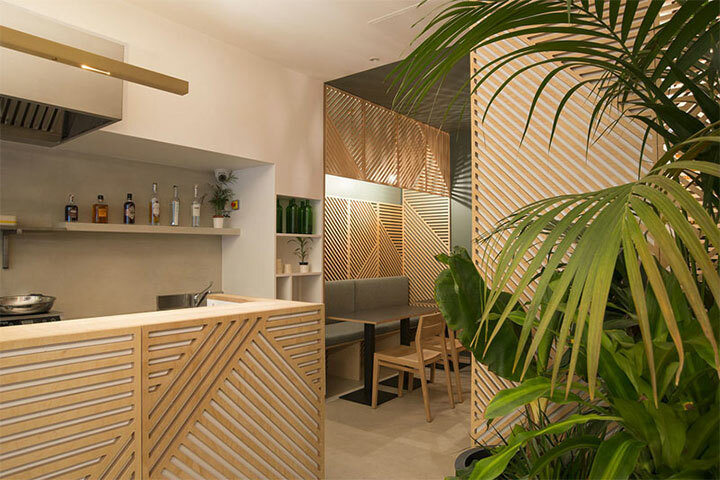 They also line up the sides of the counter, but eschew the wall behind the counter, so that the design does not become overpowering. In the back of the restaurant, the panels take on yet another role. They are used in combination with light to cast shadows on the ceiling and walls. This darker corner where the materiality of the wood panels translates into an ethereal show of lights and shadows is ideal for an intimate gathering. 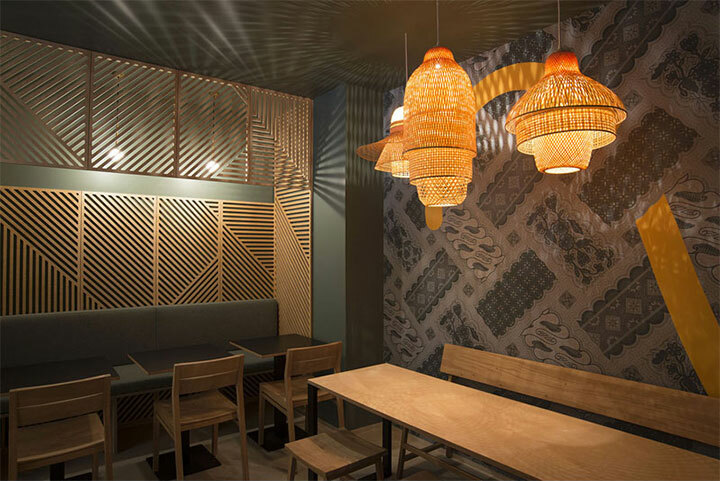 If the light pendants are modern and simple throughout the restaurant, they take a more daring shape in this corner. Peeping from behind a series of nested shades, the light is filtered and softened, transforming the fixtures into luminous globes that are as much a part of the design as the wood panels. The lights and shadows cast by these lampshades mix with the ones from the panels to create rich, interesting patterns. The light hues of the wood have an Asian vibe, almost evoking the serenity of a spa. 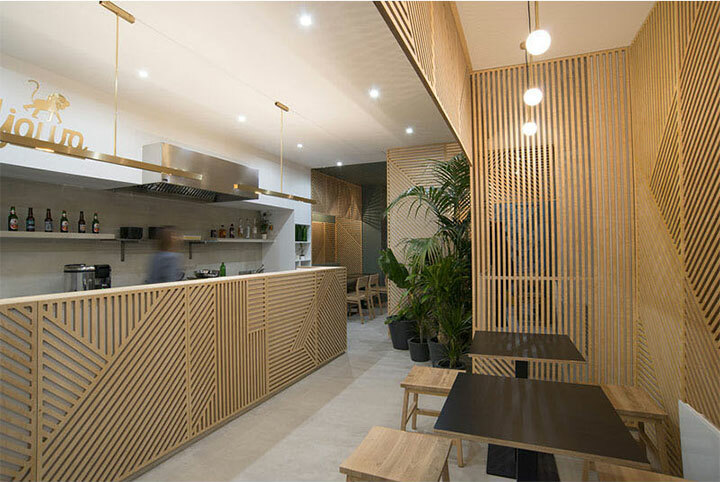 The feeling is emphasized by the presence of greenery in corners that would otherwise go unused.